India’s share in global sugar production in 2022 is forecast at 15 per cent at around 32 million tonnes. During FY11–16, India's exports of processed food and related products (inclusive of animal products) grew at a CAGR of 11.74 per cent, reaching US$ 16.2 billion. Main export destinations for food products have been the Middle East and Southeast Asia. In FY17* India’s exports stood at US$ 1.3 billion. The food processing industry is one of the largest industries in India and ranks fifth in terms of production, consumption and exports. As per the latest data available, food processing sector is expected to reach US$ 258 billion in FY15. 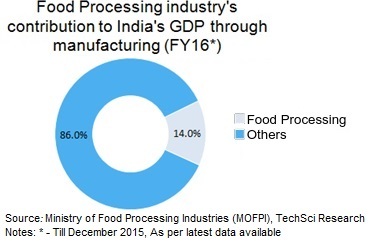 In FY16* (till December 2015), food processing industry constituted 14 per cent to India’s GDP through manufacturing. Cabinet approves New Central Sector Scheme - "Pradhan Mantri Kisan Sampada Yojana"
The Indian food industry is poised for huge growth, increasing its contribution to world food trade every year. 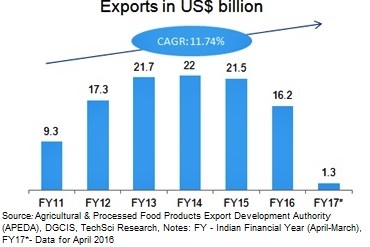 In India, the food sector has emerged as a high-growth and high-profit sector due to its immense potential for value addition, particularly within the food processing industry. Accounting for about 32 per cent of the country’s total food market, The Government of India has been instrumental in the growth and development of the food processing industry. The government through the Ministry of Food Processing Industries (MoFPI) is making all efforts to encourage investments in the business. It has approved proposals for joint ventures (JV), foreign collaborations, industrial licenses, and 100 per cent export oriented units. The Indian food and grocery market is the world’s sixth largest, with retail contributing 70 per cent of the sales. The Indian food processing industry accounts for 32 per cent of the country’s total food market, one of the largest industries in India and is ranked fifth in terms of production, consumption, export and expected growth. It contributes around 8.80 and 8.39 per cent of Gross Value Added (GVA) in Manufacturing and Agriculture respectively, 13 per cent of India’s exports and six per cent of total industrial investment. The Indian gourmet food market is currently valued at US$ 1.3 billion and is growing at a Compound Annual Growth Rate (CAGR) of 20 per cent. India's organic food market is expected to increase by three times by 2020#. The online food ordering business in India is in its nascent stage, but witnessing exponential growth. With online food delivery players like FoodPanda, Zomato, TinyOwl and Swiggy building scale through partnerships, the organised food business has a huge potential and a promising future. The online food delivery industry grew at 150 per cent year-on-year with an estimated Gross Merchandise Value (GMV) of US$ 300 million in 2016. According to the data provided by the Department of Industrial Policies and Promotion (DIPP), the food processing sector in India has received around US$ 7.54 billion worth of Foreign Direct Investment (FDI) during the period April 2000-March 2017. The Confederation of Indian Industry (CII) estimates that the food processing sectors have the potential to attract as much as US$ 33 billion of investment over the next 10 years and also to generate employment of nine million person-days. Global e-commerce giant, Amazon is planning to enter the Indian food retailing sector by investing US$ 515 million in the next five years, as per Mr Harsimrat Kaur Badal, Minister of Food Processing Industries, Government of India. Parle Agro Pvt Ltd is launching Frooti Fizz, a succession of the original Mango Frooti, which will be retailed across 1.2 million outlets in the country as it targets increasing its annual revenue from Rs 2800 crore (US$ 0.42 billion) to Rs 5000 crore (US$ 0.75 billion) by 2018. US-based food company Cargill Inc, aims to double its branded consumer business in India by 2020, by doubling its retail reach to about 800,000 outlets and increase market share to become national leader in the sunflower oil category which will help the company be among the top three leading brands in India. Mad Over Donuts (MoD), outlined plans of expanding its operations in India by opening nine new MOD stores by March 2017. Danone SA plans to focus on nutrition business in India, its fastest growing market in South Asia, by launching 10 new products in 2017, and aiming to double its revenue in India by 2020. Uber Technologies Inc plans to launch UberEATS, its food delivery service to India, with investments made across multiple cities and regions. The Government of India aims to boost growth in the food processing sector by leveraging reforms such as 100 per cent Foreign direct investment (FDI) in marketing of food products and various incentives at central and state government level along with a strong focus on supply chain infrastructure. In Union Budget 2017-18, the Government of India has set up a dairy processing infra fund worth Rs 8,000 crore (US$ 1.2 billion). The Government of India has relaxed foreign direct investment (FDI) norms for the sector, allowing up to 100 per cent FDI in food product e-commerce through automatic route. The Food Safety and Standards Authority of India (FSSAI) plans to invest around Rs 482 crore (US$ 72.3 million) to strengthen the food testing infrastructure in India, by upgrading 59 existing food testing laboratories and setting up 62 new mobile testing labs across the country. The Indian Council for Fertilizer and Nutrient Research (ICFNR) will adopt international best practices for research in fertiliser sector, which will enable farmers to get good quality fertilisers at affordable rates and thereby achieve food security for the common man. 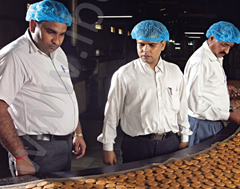 Going forward, the adoption of food safety and quality assurance mechanisms such as Total Quality Management (TQM) including ISO 9000, ISO 22000, Hazard Analysis and Critical Control Points (HACCP), Good Manufacturing Practices (GMP) and Good Hygienic Practices (GHP) by the food processing industry offers several benefits. It would enable adherence to stringent quality and hygiene norms and thereby protect consumer health, prepare the industry to face global competition, enhance product acceptance by overseas buyers and keep the industry technologically abreast of international best practices. Exchange Rate Used: INR 1 = US$ 0.0155 as of April 17, 2017.